You can download and print out a paper model of NASA’s new Orion spacecraft and have it ready in time for the first flight test of the actual spacecraft! The printout includes directions for assembling the Orion along with labels for the parts so you can find out what critical role they perform on the actual spacecraft. Orion is designed to launch atop NASA’s Space Launch System rocket, or SLS. It will eventually carry astronauts to deep-space destinations such as an asteroid and Mars. First though, the Orion needs to successfully execute its flight test in December, a mission it will fly without a crew aboard. The cone-shaped spacecraft will be lofted about 3,600 miles above Earth before being sent into the atmosphere at high speed to evaluate Orion’s heat shield for use during missions where it will be coming back to Earth from beyond low Earth orbit. This is very appreciated and looks great!! Thanks for making a copy available to us!!!! Looking forward to December 4th! Builders of this model may be interested to know that there are two versions of this model of Orion. This one includes four rectangular solar panels; another version of this model features two circular solar panels and a high gain antenna on one of the aft fairings. Numbers 17 through 20 are not used on this model’s service module forward bulkhead; they are slots intended for a reinforcement for the circular solar panels in the model’s other published version. Instructions for this model do not make note of these differences. 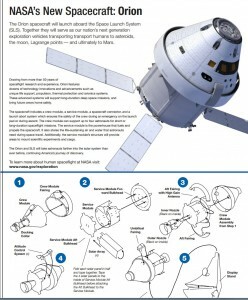 Many thanks to NASA for publishing this model of Orion!